The European Space Agency’s Envisat satellite is tracking the iceberg. The largest chunk of ice in the Northern Hemisphere is on the move – at a four-hundredths-of-a-kilometer an hour clip. Satellite imagery from the European Space Agency shows that a massive iceberg that calved from Greenland’s Petermann Glacier on August 4 has cruised into the Nares Strait, putting 28 kilometers between it and its source. 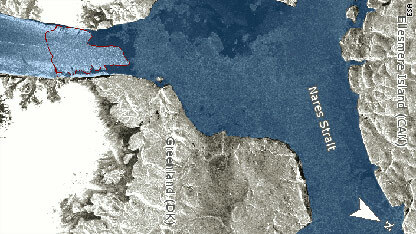 The 245-square-kilometer iceberg – that’s about four times the size of Manhattan – faces a fractured future. The satellite imagery shows it has hit a small island, which is slowing its journey but also threatening to break it up. The berg is being tracked by the European Space Agency’s Envisat satellite, using both radar and photographs. It's all Canada's !!! It's now in Canadian territorial waters !!! It belongs to Canada !!! Kiss my Canadian Arctic !!! Great, we got something big to nuke as soon somebody in the Pentagon says this could get close to US. Fund the militar! we need to get busy our soldiers stressed of the middle east!!! Como on Bush we miss you, lets call Chedney and fix this mess. I am ure this is Sadams soul fault! "It's all Canada's" Ok lets nuke Canada too!!! Can you grow weed on a iceburg? You can't! Tu Baba will get frozen, sufocating you and then finally getting it you dead. Ill buy a pound of iceburg weed right now!! I think about 5 million olives and give or take 50 thousand gallons of Gin and you have 1 hellava a martini...just stir not shaken. Now all we need is lots of soda water, gin, and the world's largest ice pick. One question. Is this the same one I heard about recently, or ANOTHER one? Yes it is indeed entertaining how many people comfort themselves with dim humor in the face of impending doom. Our pollution cools the earth. For the past 100+ years, water evaporation rates have been decreasing. It takes longer for surface waters to go up and make rain. How so: pollution makes shade. Less shade makes for higher surface temperatures (walk from under shade tree) Nothing man does or does not do can stop the earth from becoming more tropical . Whomever hijacked my screen name and poted that ludicrous "Al Gore" comment in my name...pls knock it off you infintile jerk! Hi folks. Al Gore here to say that philip12 niether voted for me nor posted that ludicrous comment made by some infintile jerk. Ilove the magarita idea! People mentioned the penguins but what about the polar bears? No dimming here! This is all highly illuminating. I didn't realize so many Epsilon Semi-Morons read CNN!! El Baboso, my drooling idiot brother, I am with you all the way!